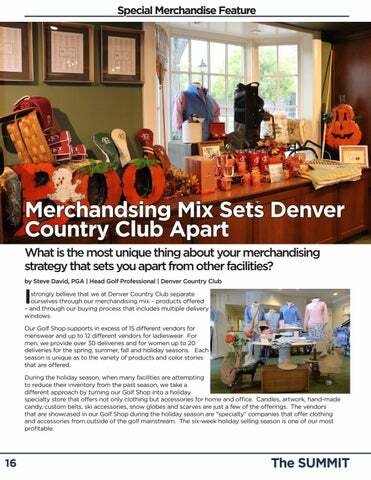 strongly believe that we at Denver Country Club separate ourselves through our merchandising mix – products offered – and through our buying process that includes multiple delivery windows. Our Golf Shop supports in excess of 15 different vendors for menswear and up to 12 different vendors for ladieswear. For men, we provide over 30 deliveries and for women up to 20 deliveries for the spring, summer, fall and holiday seasons. Each season is unique as to the variety of products and color stories that are offered. During the holiday season, when many facilities are attempting to reduce their inventory from the past season, we take a different approach by turning our Golf Shop into a holiday specialty store that offers not only clothing but accessories for home and office. Candles, artwork, hand-made candy, custom belts, ski accessories, snow globes and scarves are just a few of the offerings. The vendors that are showcased in our Golf Shop during the holiday season are “specialty” companies that offer clothing and accessories from outside of the golf mainstream. The six-week holiday selling season is one of our most profitable.